Is the Amazon Marketplace a healthy business environment for resellers or not? This is an important question that needs to be addressed and better understood by all merchants, not just those involved in the office products and supplies vertical. The last 10+ years have seen countless failures by resellers as they've put up shopping cart sites in order to try their hand at online commerce. A lot of time and money has been wasted with efforts that, for the most part, never stood a chance to succeed. Of course, the online environment is dynamic and what's required to be successful today is quite different from what was required 10 or more years ago. Nevertheless, efforts to develop an online presence by continuing to throw up shopping cart sites, without a determined and sophisticated traffic development strategy, are naive and destined to continue to fail. 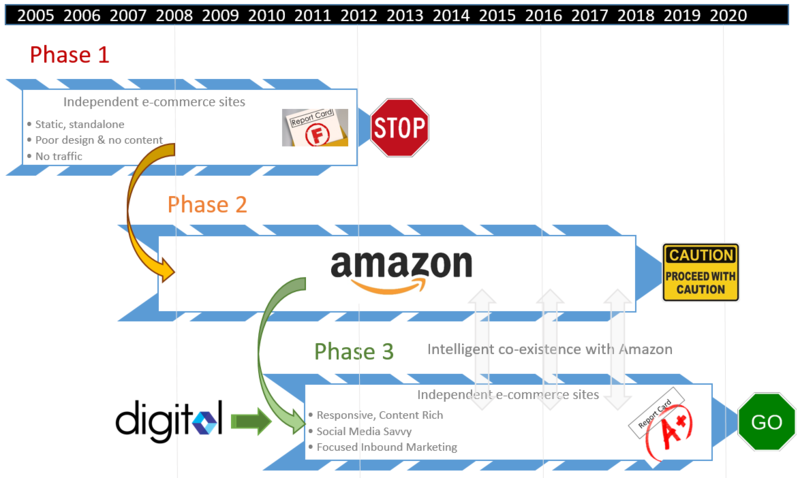 It's perhaps unsurprising, and perhaps largely as a result of these failures that, over the last few years, there's been a trend for resellers to abandon their independent online efforts and to enter the Amazon Marketplace. On the face of it, the logic is quite sound. Amazon is by far the largest e-commerce portal in terms of transaction dollars as well as site traffic with 95 million unique monthly visitors and, if a reseller can't get traffic to its own site, then why not join a marketplace that already has traffic and to conduct its online commerce there? However, although the Marketplace is there for anyone to participate in and attempt to take advantage of, there are formidable barriers to overcome in order to conduct profitable transactions. Not unlike any other business venture, there needs to be research and a plan, followed by setup and execution. Within the Marketplace, it must be remembered that Amazon's objective is to drive sales, regardless of which seller the product comes from, so they will always point shoppers to the products that are most likely to sell. Of course, the products that are most likely to sell are those that appear in search results and the two most influential factors in determining a products search ranking, are its sales performance history and its relevance. The Marketplace is an intensely competitive environment and, although having the lowest price is not a guarantee of sales, it clearly plays a leading role. It's logical to conclude that competitive pricing is an important requirement for conducting sales and establishing a sales history. Unfortunately, for a new or recent merchant on the platform with little to no sales history, it's difficult to rank well in search results. It's possible for a seller to influence search results by optimizing its product content setup and improving its relevance for search terms. However, (unless you own and register your brand in the Amazon Brand Registry) there's a dilemma with this approach as well. Investing resources to provide the best description and features for a product detail page, while not owning the Buy Box, means a reseller is essentially implementing conversion rate optimization (CRO) best practices for all of its competition. As I've explained, Amazon's objective is to convert the maximum number of searches into sales so, if they see better descriptive elements for a product, they will select those elements (or pieces of them) regardless of whether or not it's for the seller's product. In other words, the product content assets developed by a diligent seller become a shared resource in the Marketplace that may help lower priced, less diligent competitors to become more successful. For this reason, it's important that efforts to optimize product setup are invested into products where ownership of the Buy Box is high, or for products that may be exclusive to the seller. ASIN Amazon Standard Identification Numbers are unique blocks of 10 letters and/or numbers. A new ASIN is created when a new product is uploaded to the Amazon catalog and can be found on the product detail page. Amazon Brand Registry Brands that are part of the AMZ Brand Registry have higher authority over their product listing content as the listing content is no longer shared. Products associated with an approved brand are assigned a GCID, not an ASIN. Buy Box Product detail page is where the battle for the Buy Box ownership takes place. Over 80% of sales are determined from the Buy Box. Buy Box Eligibility Professional sellers who have met performance requirements become eligible to compete for the Buy Box and, when unsuccessful, to compete for the "More Buying Choices" box. Buy Box Ownership Share Winning the Buy Box is a major advantage for sellers on Amazon. It's an ongoing process as sellers earn a share of the Buy Box, or rent it for a period of time. 80%+ of Amazon's e-commerce sales result from the Buy Box. Buyability (B) Converting shoppers once they land on a product page. Explains why an overall AMZ strategy should be focused around Buyability which, in turn, is strongly influenced by the quality of the content provided by the seller. Category Specific Data Attributes Optional fields to populate to provide more information about the product - influences Discoverability via filters as well Buyability via conversion rate optimization (CRO) through maximizing the amount of product details on a page. Conversion Rate Optimization (CRO) Optimization of the content on product detail pages in order to match with popular searches conducted by potential shoppers. Description Heavily weighted in SERP - maximum of 2,000 characters per description. Featured Merchant Preliminary status required in order to become eligible for the Buy Box. In most cases, a rating greater than 98% will obtain the Featured Merchant status. Fulfill By Amazon (FBA) Seller ships product to Amazon warehouse - Amazon handles storage, packaging, shipping & customer service. Products are eligible for Prime (V. important because 20 million members instinctively filter by Prime). Amazon ensures a strong correlation between FBA and higher sales performance through improved discoverability and buyability. Fulfill By Merchant (FBM) Seller is responsible for storage, shipping & customer service. Pricing strategy should be to include shipping & handling. It's far less likely for and FBM seller to win the "buy box" over an FBA seller. Fulfillment Method Influences both Discoverability & Buyability - i.e. FBA improves both! Fulfillment Latency The length of time it takes you to ship after receiving an order. The lower the latency, then the better prospects for appearing in the Buy Box. GCID Global Catalog Identifier - this differs from the ASIN in that it's linked directly to a product and will never change, whereas an ASIN is tied to a product listing and can change. The GCID is a 16 character alphanumeric code. Images High quality, zoomable - one main image and up to eight secondary. Inventory Depth Sellers with consistent and sufficient inventory to avoid stock-outs can be granted a higher Buy Box share. Inventory Quantity Merchants will quickly drop down the Search Engine Results Performance (SERP) if they have no inventory. Keywords AMZ is unique allowing sellers to provide a list of keywords. Used to be a max of 5 fields x 50 chs. = 250 chs. Total. Feb 2016 changed to 1 field x 1,000 chs. Landed Price List price plus shipping & handling. Landed price is regarded as one of the most influential Buy Box factors and is within the complete control of the seller. Price Optimization It is a myth that the lowest price ensures winning the Buy Box. Optimizing price will increase chances of winning the Buy Box and increase profits. Product Ads (Sponsored Links) Allows retailers to advertise on the Amazon marketplace without having to sell on the marketplace itself. See also Sponsored Links. Product Content The single largest factor in increasing a listing relevancy (for a given search) and therefore a huge driver of discoverability. Product Features Up to 5 fields can be populated and each should include information that may favorably influence a sale. Features should be built in a consistent order - i.e. if the first feature is country or origin then make sure it is so for all products. Product Reviews Drives discoverability via search filters - i.e. shopper applies search filter to eliminate products (for example) with less than 3 stars. Product Title The most heavily weighted aspect of product content - 250 - 500 characters depending on product load method (CSV or XML). Relationship between (B) & (D) By increasing sales (Buyability) the product rises higher is search results and thus also increases Discoverability thereby driving a virtuous cycle. Reseller Strategy When to focus resources on Discoverability Vs. Buyability and vice versa. Seller Feedback Influences Buy Box ownership share less than the Seller Rating does, but still important. There are two components; the Seller Feedback Score and the Seller Feedback Volume. Seller Fulfilled Prime (SFP) Allows FBM sellers to reach Amazon Prime Members without being forced to stock product in the Amazon DCs. Seller Rating One of the top Buy Box factors is essentially an overall assessment of how well inventory management, order management, fulfillment and customer service are handled. Sponsored Links Sponsored Links are advertisements related to a recent product search query or content on the page and are always clearly labeled. Clicking on a link will take the user out of the Amazon Marketplace to a 3rd Party site. Sponsored Products Amazon's inter-Marketplace pay-per-click program. Only sellers who are eligible for the Buy Box and are selling in the available product categories are qualified for Sponsored Products & Targeted Ads. UPC A Universal Product Code is a 12-digit bar code used extensively for retail packaging in the United States. To load a product to the Marketplace you must have a UPC. Because a unique product has been created and, even though it has no sales history or discoverability, the Buy Box for that product will be owned by the merchant. Next, by utilizing the Sponsored Product program the seller opens up the possibility to pay for increased discoverability. A strategy like this can be an effective acceleration tool for enhancing product discoverability and developing sales. However, the costs to promote the brand and its associated products in the Marketplace are likely to be quite high and possibly beyond the means of a small merchant. Also, somewhat complicating this approach, it must be remembered that eligibility to win the Buy Box is not available until a seller has achieved "Featured Merchant" status. Without the increased discoverability made possible by a Sponsored Product strategy, there will be little to no brand awareness, low discoverability and, little to no sales. Whether selling FBA or FBM, Amazon handles the credit card transaction with the customer and, after deducting its fees, sends the balance of the funds to the seller. Because Amazon deals directly with the customer, it's very difficult for the seller to build a direct customer relationship. Furthermore, it's Amazon's platform, they set the rules, they may change them at any time and, they can adjust them to favor certain sellers who may have sufficient volume to influence them. Remember, it's Amazon's objective to drive sales regardless of which seller the product comes from. A repeat customer has little to no incentive or motivation to attempt to seek out the previous seller. Instead, the customer is going to be heavily influenced by whatever seller appears in the Buy Box. For a commoditized product (like ink and toner), and with many sellers active in the Marketplace, the chances of the same seller appearing in the Buy Box three to four months after a prior transaction are remote. The point here is that there's little to no loyalty between the seller and the customer. Instead, the loyalty is between Amazon and the customer so, it should be clear that Amazon owns the customer, not the seller. What if Amazon decides to sell direct and compete with its merchants? When Amazon decides to enter a category they purchase the product they need from a vendor in that category. They are prepared to price the category to achieve their market share objectives and, as they do not agree to any Minimum Advertised Pricing (MAP) rules, there's a danger to both the FBA and FBM merchants that Amazon may undercut them in order to achieve their market share goals. The potential to be able to price lower than existing Buy Box prices. The ability to award itself a perfect score on the service elements necessary for winning the Buy Box. Perfect knowledge of the platform rules for Buy Box placement. The ability to adjust their sell price to any level. For these reasons Amazon is effectively able to guarantee it will win the Buy Box when it chooses to do so, and can achieve this result using exactly the same Buy Box placement algorithm as is applied for all the Marketplace merchants. What's the outlook for pricing when Amazon is competing with its merchants? No one understands the rules for the Marketplace better than Amazon itself. Of course (you would think) they want to maximize their sales and profits, so we shouldn't assume they'll automatically engage in predatory pricing strategies because this may compromise their profit objectives. However, the key point to understand here is that Amazon most likely has short and long-term objectives. In the short term they may be more motivated by market share than profit and, in the long term, they may be more motivated by profits. The Amazon platform provides the clear potential to buy market share in the short term, eliminate competition, and then to increase prices to maximize profits. Amazon periodically approaches its vendors to participate in promos which are incentivized with a commitment for increased sales volume in return for an agreement to a discount off the list price. So, for example, a 15% promo may result in a "commit" from Amazon to sell 100 units over a certain timeframe. If the vendor accepts, then Amazon immediately places the purchase order and takes the promo dollars (in our example $18 x 100 = $1,800), regardless of whether or not they subsequently sell the target volume within the targeted timeframe. Note also, in this example, a 15% discount off the list price is, in fact, a 25% discount on the original negotiated sell price of $70 per unit! With the promo dollars, Amazon is equipped to engage in pricing that effectively guarantees they will own the Buy Box at the expense of its merchants in the Marketplace. When they target the Buy Box (for example) at $95, then many of the merchants may "chase" the price down to that level (eliminating all their gross margin on the way), while Amazon's keg remains basically full of powder to take the pricing as low as may be necessary for it to continue to own the Buy Box. In this scenario, the merchants that brought the category and the customers to the Amazon platform will gradually be eliminated, leaving Amazon controlling a larger share of the market. Inevitably, as competition is reduced, prices will start to increase. Let's not forget, the resellers I'm talking about are mostly the smaller guy's who have effectively gone to Amazon as their last resort for sales growth. Their independent e-commerce efforts have failed, their efforts to take share from the OEMs have mostly failed and, their efforts to take share from the Big Box retailers (selling OEM and premium priced aftermarket cartridges), have also failed. Now, as they're eliminated from the Amazon platform, there's nowhere left to go. It's not like they can exit the Marketplace, wait on the sidelines for a few months while prices increase, and then step back in. It's simply too late for this option as they're confronted with the final step in their business cycle and forced to exit permanently. Everyone's drawn to Amazon because of the prospect of selling large volumes. But, to stand any chance of selling volume, not only does the seller have to incur a significant time and resource investment for setting up the products and for learning how to sell on the platform, it must also have deep pockets to finance winning the Buy Box over a sustained period in order for its relevancy, and then its volume on the platform, to be developed. Unfortunately, as we've shown in our example, due to the structure and nature of the marketplace, success can lead to punishment. If a seller (or group of sellers in a specific vertical such as office supplies) is successful, Amazon notices and enters the category to compete directly. Because of the volume incentives, that they're able to offer vendors, they have the ability to guarantee themselves control of the Buy Box from which over 80% of transactions in the Marketplace occur. Not only does Amazon control the Buy Box, they also know every single customer that's ever purchased through their platform. Remember, it's unlikely a merchant selling in the marketplace will experience repeat orders from the same customer and, consequently, doesn't know the frequency of a consumers demand. This, however, is not the case for Amazon. A customer buying the same item every three months from four different merchants, while each individual merchant has no idea of the three-month buying pattern, Amazon absolutely knows. So, when the next customer demand is anticipated (for example month fifteen), then who do you think may be poised with a vendor financed promo to win the business? The Marketplace is not for the faint-hearted and it's certainly not a silver bullet solution. In the short term it's expensive to get started and, in the long term, it's somewhere between difficult and impossible to establish a business that adds value to a resellers enterprise. A future buyer of a resellers business may be inclined to discount any revenue and profits earned in the Marketplace because he knows Amazon can change the rules and take that business away at any time. Sellers must treat the Marketplace dispassionately and objectively. Amazon may try and make its merchants think they're its partner, but it's not, it's their competitor, and it will always treat them as a means to achieve its end, not theirs. Once this cold, hard reality is understood and recognized, then merchants must adopt a similar stance by implementing strategies that allow them to treat Amazon as a means to achieve their end. We'll publish additional material in the coming weeks specifically related to tactics that may allow resellers to leverage the benefits of the Marketplace in the short term while implementing strategies for growth in their local markets in the medium to long term. Strategies where, most importantly of all, they will own the hard-earned relationships with their customers and their prospects in their markets. In the meantime, for additional reading on the state of the office products and supplies industry, and to help you develop a better understanding as to why there are still great opportunities in the office products and supplies vertical, please click on the button below and download a free copy of our e-book. This contains valuable information on the industry, how to take advantage of the current conditions and to help understand a strategy for achieving profitable sales growth.